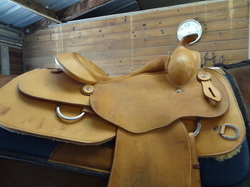 Western/ Other Saddles for sale. 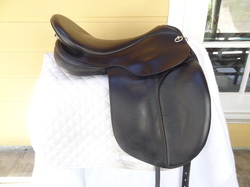 16 inch seat, Semi-QH, Flex Lite tree, padded seat has some wear (see photos). Rear matching cinch. Synthetic fleece on the bottom is good shape. Softer, lined bridle leather on the skirts and fenders. This saddle would best fit a horse with a relatively straight back. 15 inch seat, FQHB, light oil color with suede seat and rough out fenders. 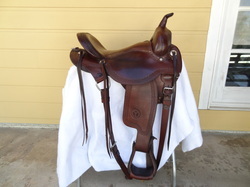 This saddle would be a great training saddle for the AQHA show horses. Padded and deep seat. Sheepskin fleece in great condition. This saddle would best fit a wide horse with some contour to the back. 16 inch padded seat, adjustable gullet, black leather endurance saddle with endurance stirrups and no- chafe stirrup leathers. Made in Germany, english style billets for and english dressage type girth. 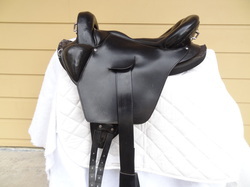 This saddle can be adjusted in width from Medium to Wide and can also be adjusted from front to rear for a straight backed or contour backed horse.